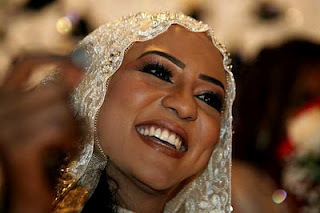 Sudanese President, Idriss Deby shook the foundations of Khartoum-The Sudanese capital on Friday 20th January 2012 when he invited about 400 dignitaries to his wedding engagement to daughter of Sudan's Janjaweed militia leader, Musa Hilal, a graduate in her 20s. Held at a 5-star hotel, Deby according to press reports paid a whooping sum of $26 million dowry of which $25 million was paid to her father and the rest to her in the form of gold and jewellery. Security at the classic hotel was beefed up very early in the morning and more than 100 police personnel were involved. Though the couple were absent at the wedding (strange isn't it), the hotels guests were barred from getting close to the swimming pool area which witnessed the celebrations, President Bashir represented the bride while Deby was represented by a family relative named Abdo Ongi. The bridegroom, in his 50's, has been married several times with about children. At some point, there were speculations that the pretty bride was forced into marriage, "No one has forced me into this marriage, we are not in the Stone Age," she defended. Her father likewise denied charges that he sold his daughter for the money because of the age gap/for political motives. But seriously guys, is $26million dowry not capital madness? Is her tissues, cells, organs and system made of gold? Their citizens wallow in acute poverty while they enrich themselves through corrupt means, infact, the fad is to spend money on women/marriage! Personally, I think there's more to this!!! @Ololade, na so dose silly leaders dey do? Spending $26m for a lady is just a stupid decision. He's an unreasonable spendthrift!